Clam Lights in Renton is a unique Seattle Holiday tradition! The Christmas Ship Festival is THE unique Seattle holiday tradition that is not to be missed (and we previously talked about here)! What could be more Seattle than boats decorated with holiday lights?? With events nearly every night throughout the holiday season. You can pay to ride on board one of the boats (which is fun and worth it), or you can watch for free from the shore at various locations. A number of the events even have an official shore event with the choir music broadcast from the ship and bonfires! Our favorite is the final night, December 23rd, with the shore party at Gasworks park. 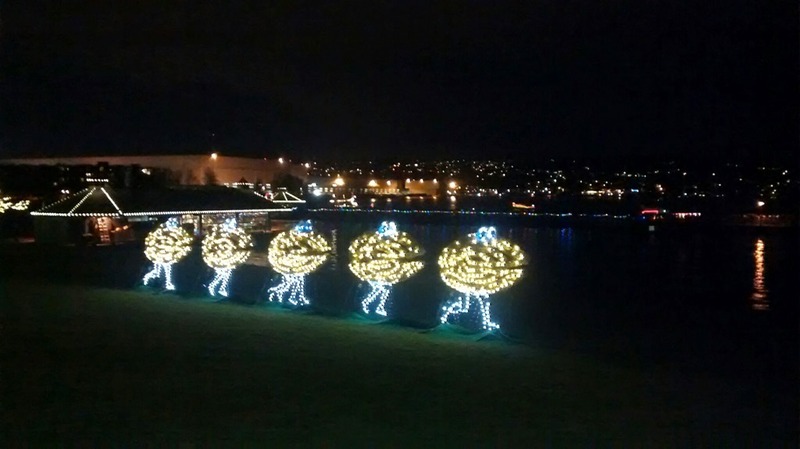 Clam lights is a fun and free light display in Gene Coulon park along Lake Washington, which includes the Christmas ship parade on opening night (November 30th) and some of the other nights as well. Dancing clams in holiday lights?? What’s not to love? And how old school Seattle is that?? The Figgy Pudding Caroling Competition takes place the first Friday of December every year from 6:15-7:15pm, with many group of carolers in costume signing for charity. You can walk around and here a ton of different groups and donate to their charity if you choose. Just listening to the caroling itself is free. It’s very festive and a great way to check out all the holiday decorations in downtown Seattle. For a suggested donation of $5 per person, you can stroll through the magnificent gingerbread village at the downtown Seattle Sheraton Hotel, built by Seattle’s builders, architects and the Sheraton’s chefs! Each year features a new theme for the village and will delight young and old alike! Be aware of long lines on weekends. Candy Cane Lane is another delightful free holiday tradition in Seattle. A few blocks of historic homes in the Ravenna neighborhood sport an impressive display of lights! This is an unofficial neighborhood affair, so there is no official start date or times, but generally by the first week of December all the lights are set up! You can drive through Candy Cane Lane, but you can also park nearby and walk around if you’d like to spend more time. Technically, Candy Cane Lane is NE Park road (off Ravenna Blvd), but if you tell Google Maps to take you to Candy Cane Lane, it will take you right there! Pike Place Market is open and bustling year round and is a great place to purchase handmade and local gifts as well as delicious food for those holiday meals!